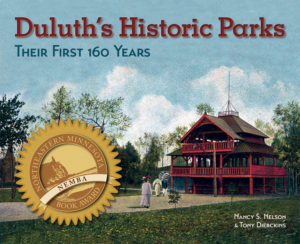 In 1939 Robert and Mabel Thornton moved to Duluth from Des Moines, Iowa, and opened Thornton’s Kiddieland adjacent to the zoo at Seventy-second Avenue West and Grand Avenue. It catered to children “toddler stage up to twelve years old” and for seven years its sole attraction was a miniature train. 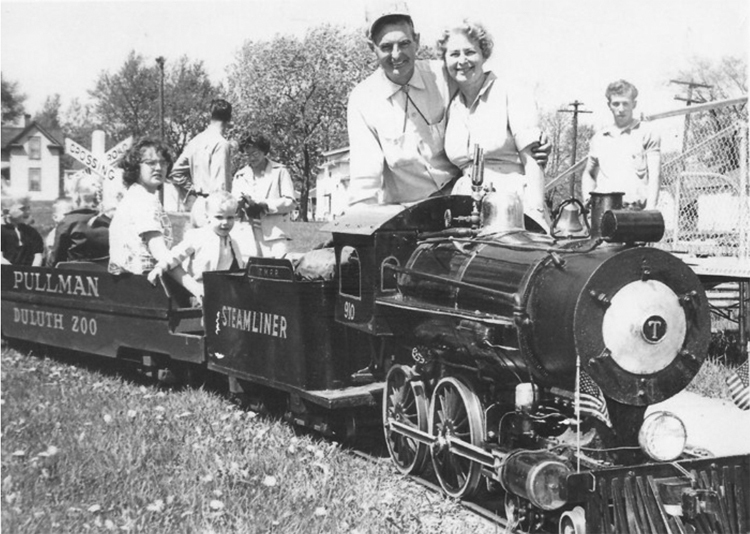 According to Robbie Bailey, the Thornton’s daughter, Robert’s father Elmer O. Thornton built eleven steam-powered miniature locomotives, and his son Robert owned two of them. One operated at Kiddieland, and the other was used for the Austin and Owatonna county fairs and the Minnesota State Fair. Running Kiddieland wasn’t Robert’s only job. He also worked as an engineer for the Duluth, Missabe & Iron Range Railroad from 1942 until his death in 1965. Thornton began expanding Kiddieland in 1947, first with a car ride and then a boat ride, a Chair-O-Plane ride, a Ferris wheel, and a “Little Dipper.” In 1964 the facility acquired the merry-go-round from the recently closed Minnesota Point Amusement Park. That year the Duluth Herald noted the facility’s twenty-fifth anniversary. At the time, the paper reported, Sunday was the busiest day for Kiddieland, but Monday—free day at the zoo—was a close second. About half of its customers were tourists, and elderly residents of St. Louis County’s Cook and Arlington homes also “enjoyed the train ride” along with the children. The Thorntons were big supporters of the Duluth Zoo. In 1958 Mabel Thornton helped organize an event to raise money to help the zoo purchase a hippopotamus and donated the day’s Kiddieland receipts to the cause. They also helped the zoo purchase black panthers in 1964. After Robert Thornton’s death in 1965, Mabel sold the facility to Jerry Mitchell, who later turned it over to Jeff Vollma. Over the years the facility added a moonwalk, a roller coaster, and a large slide that children slid down on wool blankets. The miniature train may have been removed to make room for the slide. In September 1975 Duluth’s Parks and Recreation Advisory Board recommended that the City Council close Kiddieland because “the amusement center detracts from the main thrust of the zoo.” The council sent the recommendation back to the board, but, even so, Kiddieland would be gone soon enough. On June 3, 1977, between one and two hundred “young people” gathered at the zoo’s parking lot next to Kiddieland. The spot had become a popular place to party. A twenty-two-year-old man entered Kiddieland (some say he jumped a fence, others said the fence was in disrepair and easily circumvented) and climbed to the top of the big slide using the structure’s girders—the stairs were not accessible because they had been blocked to prevent unauthorized use of the slide. The man did not know that a chain had been stretched across the base of the slide, also intended to keep trespassers off. When he slid down the man’s throat hit the chain, sending his head backward against the slide, causing fatal injuries. In 1981 the victim’s widow brought a successful lawsuit against Vollma, although the victim was also determined to be partially responsible for the accident. As a result, Vollma closed the amusement park. Adjacent to Kiddieland, Gerry and Sophie Little ran the Zoo Snack Shop, a concession stand that sold candy, ice cream, hot dogs, popcorn, and other treats. Ron House, a grandson of the Littles, recalls that the zoo’s elephant, Bessie, was known for her wandering and welcomed his grandfather at the stand on several mornings. Another of the Little’s grandchildren, Harvey “Bud” Simonson, ran the concession stand after Gerry entered a nursing home. Simonson purchased the business following his grandfather’s death in 1979. The Zoo Snack Shop closed along with Kiddieland.